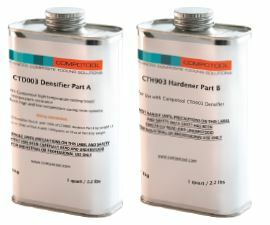 The COMPOTOOL CTD003 Densifier is a two component solvent based product. It penetrates into the surface densifying the Compotool board strengthening the surface. COMPOTOOL CTD003 Densifier is used as a pre-application to adhesive bonding and before surface sealing. With a clean soft cloth gently wipe the excess dust off the surface. Small amounts of dust on the surface will not affect the adhesion of the COMPOTOOL CTD003 Densifier. We do not recommend blowing the surface with compressed air as it will pit the surface. It is not necessary to wipe the surface with any type of cleaner before applying theCOMPOTOOL CTD003 Densifier. Thoroughly shake each component of the COMPOTOOL CTD003 Densifier before opening. Combine the two components 1 to 1 by weight and mix thoroughly. After mixing Part A and Part B together thoroughly, the COMPOTOOL CTD003 Densifier is ready to be applied. Generously wet your applicator (we recommend using a foam brush or foam roller for fast generous application) and evenly apply it over the complete surface. The coats will be quickly absorbed into the board. Apply 9 to 10 coats wet on wet. Allow to dry at room temperature (20ºC/68ºF) for 12 hrs. Elevated temperatures will reduce time. 80°C/176°F for 1hr. 150ºC/300ºF for 30 mins. Do not exceed 150ºC/300ºF at this stage. Prior to applying sealer, it is recommended to give the dry densifier a scuff with Scotch-Brite to dull the surface. Application of COMPOTOOL products should be performed in a well-ventilated area. The COMPOTOOL board must be clean and dry before use. COMPOTOOL CTD003 Densifier is sensitive to variations in application technique and thickness. It is important thatthe user carries out their own test and trials to determine how many coats are required for desired surface finish and application technique. Mould configuration, room temperature and humidity will influence the cure time from that detailed above. COMPOTOOL CTD003 Densifier must be used in conjunction with CTA505 Adhesive, CTS101 Sealer, CTS202 Sealer and CTS404 Release to seal the micro-pores and give a good release.